I thought I would rerun an old WFMW from the beginning days of my blog since many of you haven't seen it and I still use it! 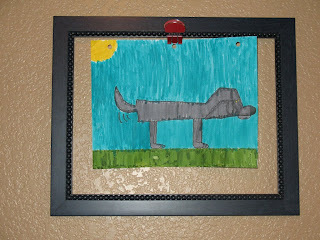 Kids always have their favorite artistic creations that they want on display. Is your refrigerator covered with paper? Not mine...OK...well, not as much as it used to be. I saw a great idea a few years ago for a way to display art that was easy to switch out. Just in the last couple of years, I finally did it! You get open frames and hang them on the wall, letting the wall color show through. The original idea I saw used double-stick tape or push pins to stick the art in the middle of the frame. I didn't want to make a mess of my walls, so I bought colored binder clips and hubby screwed them into the frame ( I was going to glue it). Do you have a fun way to display artwork? 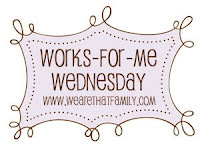 Be sure to stop by We Are THAT Family today to see more WFMW ideas! By the way, I want to thank my readers so much for checking in for my shout-out! You're great! So far, readers have commented from 7 countries and 23 of the United States! It's not too late to check in - I'll keep track all week! Hi Lisa. This is such a cute idea! 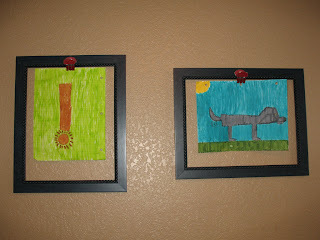 There is something similar that I'm going to do to house my childrens artwork. Big better on the wall as art work then on the fridge as clutter size hugs to you! LOL! Have a fabulous day my friend. I love this idea, especially for displaying the "best" pieces in a family room or living room. We use an art line in our son's bedroom for all his work, but no one sees it but him. Maybe we'll try this too. Thanks for sharing! Oh my....such a cute and simple idea! I'm bookmarking :) Thanks for sharing!! That is a really good idea!! GREAT idea and it looks so cute. What a great idea! You're so creative my friend!